One of the busiest days on the Motor Parkway was June 16, 1927, when Charles Lindbergh returned to Roosevelt Field to celebrate his successful solo flight to Paris. Lindbergh had taken off from the Roosevelt Field east runway 27 days earlier. The Motor Parkway is the road in the middle of the image running parallel to Stewart Avenue on the right. The circle in the photo was formed by rows and rows of automobiles surrounding the dedication area. Stewart Avenue was a major access point that day with traffic using the bridge over the Motor Parkway to reach the ceremonies. In the same location 81 years later the Merchants Concourse Bridge takes shoppers over the Meadowbrook Parkway. 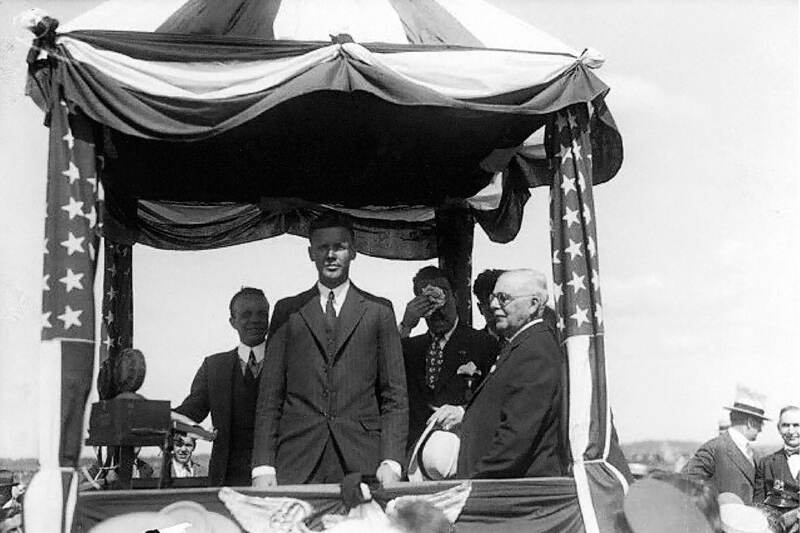 At the homecoming celebration in the center of the circle, Colonel Charles Lindbergh addressed an estimated crowd of 25,000 people and promoted the development of Roosevelt Field as a major aviation center. Lindbergh had landed his Spirit of St. Louis plane at Roosevelt Field earlier in the morning. Great photo. Lindburgh stayed awake for 55 hours to make the flight to Paris. What a piece of history. In 1951 they closed the field and turned it into a Mall. It is very close to Garden City, NY and most who live there have no idea what happened on that strip of land in 1927. They drive right by.